You know that I like to travel and write about the experience of my trips. I’ve always been that way in the family. Don’t ask me why but I’ve always been extremely attracted by les pays du Nord — Scandinavia in general. 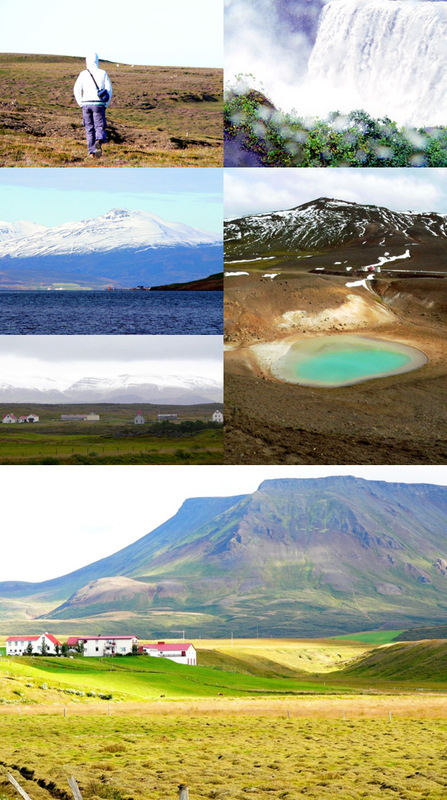 Over the years, P. and I traveled twice to Iceland and once to Denmark. And we’ve been dreaming about Norway. I’ve not yet been to Norway but it’s a destination high on my list. So when Hanne, a journalist working for the Norwegian magazine Maison Mat & Vin, emailed to ask if she could interview me for a feature in their magazine, I felt pretty excited. It had me dream of traveling to Norway and its colors and fjords and culture again. Lulu will love it as much as we will — I know. 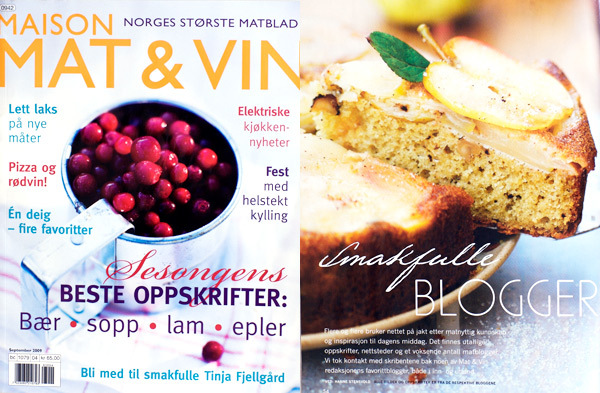 The article Hanne wrote is about food bloggers and was just published in the September 2009 issue — the recipe of mine they featured is my upside down olive oil apple cake. I was really happy to see fellow food bloggers like Ilva, David and Cecilie. I don’t speak Norwegian but sometimes it doesn’t matter. Pictures speak for themselves. 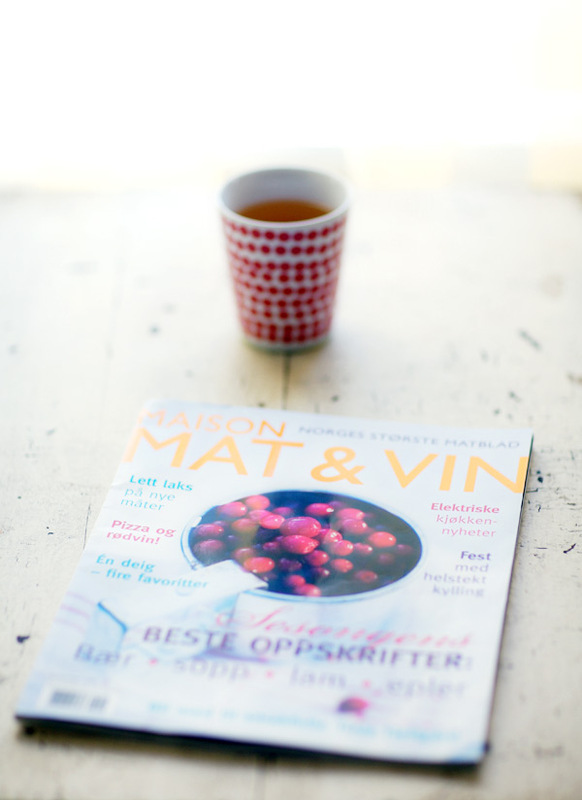 Maison Mat & Vin is one of those delicious-to-read food magazines that make you dream of food and travel. Scandinavia is beautiful – I myself live in Sweden – so I understand why you love it. Now we have had a couple of great autumn weeks here with a warming sun and blue sky. The trees have turned in to fireworks of yellow and red and every shade in between. I love it! Congrats to the article in the Newspaper. You always inspire me! toujours de magnifiques photos et felicitations pour l’article! The upside down olive oil apple cake is my favorite!!!!!! I LOVE IT! You will love norway. I am from Lofoten up north in Norway but live now in Trondheim in the middel of Norway. The light and the weather is so amazing. Love youre article in the magasin. Congratulations on checking another great achievement off your list. Looks like a beautiful article. Great exposure for you in Scandinavia, and from the previous comments, it seems they already know who you are! It’s such a small world. I too love Scandinavia and my visits there have been all to brief. These days I travel through cooking shows on PBS. Have you seen New Scandinavian Cooking (www.scandcook.com)? Beautiful series. Thanks so much for the Maison Mat & Vin link. I’m going there now. Great photos Béa! wow and i just bought the ingredients for this cake today!! i love it! I think it’s great to be featured in a magazine with those berries on the cover (yummy!!!). Unfortunately Norway is pretty far and expensive also for us south europeans and I’m still try to find a good method to have enough free time and money to travel wherever I like. Je vois que nous partageons la même attraction presque inexplicable pour les pays du Nord 🙂 Depuis quelques années, je vais régulièrement au Danemark (une de mes cousines y vit), mais la Suède et la Norvège me tentent aussi. Bravo pour le magazine ! bravo pour ce bel article:) tu as raison de rêver de la norvège, c’est un pays magique! Congrats on the interview! Never been to norway or any of the pays nord and would love to visit myself. Congratulations. How exciting for you. We’ve never been to Norway, but it looks gorgeous. We love France and can’t seem to stray any further than Provence. Now you’ve got me thinking about Norway. We spent a Christmas in Germany years ago and it was so cold we decided we didn’t want to visit any country when it was cold. Is there a summer season in Norway? how wonderful, all those places are dreamy! congrats on the article must try cake! I don’t know how you feel about reading some lines about you in articles, but it should be a very interesting thing! Bravo Béa, la notoriété te sied à merveille! Her tok det virkelig av CECILIE ♥ Du forjener det SÅ , har ventet på dette!! du har ALLTID gjort ALT skikkelig ,med en fantastisk innsikt. du er utrolig kreativ,stilren,perfeksjonistisk på en behagelig måte . Enjoy & Start writing a book – PLEASE ! Congrats Bea! We too would love to travel to Scandinavia, it looks like a place with incredible light, colours and natural beauty. Congratulations, how wonderful Béa! Norway is drop-dead gorgeous, especially the West coast of it. I’ve been there twice, and the Norwegians are quite aware of it and think New Zealand, which you and I have both been to, is “ok too” (it’s quite humorous actually). I hope you’ll go there soon and we’ll see some beautiful pictures from you about it. Looks like a great magazine. Glad to see that you’re featured! Je suis contente qu’il y ait un article sur vous et votre blog dans Maison Mat & Vin. Je suis une Canadienne expatriée en Norvège et je lis votre blog de façon régulièrement. Congrats! I’ve been to Finland in the winter and absolutely loved it! Oh how did I miss that?! Congratulations Bea! Well deserved! What a beautiful layout! And that post with the apple cake is one of my favorites! Norway is beautiful. I visited last year for the first time and look forward to going again sometime in the future. Being of Norwegian descent, it was great to see where my family came from. I just revisited all of my Maison Mat & Vin magazines for new inspiration, et voila, here I am! Your blog is beautiful; the pictures are so lovely, and the recipes…I want to try everything! I think Norway is definitely worth a visit, and if you some day decide to come, the west coast is a must-see! I come from from Bergen, but I live in Oslo, and just now I’m in your home country learning my brunoise, ciceler, mirepois etc.. Day 2 at Paul Pocuse and I’m so excited I can’t believe it! Please send me a note if you should take a trip up north and you would like som domestic insight. Thank you so much for sharing! Je ne peux m’empêcher de commenter cet article. Cela fait plusieurs semaines que tous les jours, je choisis au hasard sur votre blog une dizaine d’article, et je me remplis les yeux de magnifiques photos. Superbe l’étudiante. Quelle chance! Profitez-en bien! I guess I’ll just sum it up what I wrote and say, I’m thoroughly enjoying your blog. I as well am an aspiring blog blogger but I’m still new to the whole thing. Do you have any suggestions for beginner blog writers? I’d really appreciate it.